I read it in one day, for the price of a movie ticket. It is a book containing four sequential short stories that elaborate a particular niche and theme within the grim dark fantasy setting of Khaim, The Blue City and its ecologically devastated environs, ruled by The Jolly Mayor and assisted by Majister Scacz. Khaim was once part of a grand (Jhandpara) Empire built and connected by magic as the dominant technology but the fallout to this excessive magic use was the spread of toxic bramble feeding on magic use, that overtime has led to the settings devastation of ecological proportions. Individuals in the setting are faced with a game theory dilemma of not using magic to solve unique issues, thus sacrificing their needs (sometimes a choice of life or death) for the greater good versus using magic to solve an otherwise insurmountable problem, ranging from a bit of magic (“really such a small amount of magic”) to the power mad aspirations of the official Majister, either use adds in a quantitative way to the spread of the bramble. It is an obvious environmental catastrophe metaphor which dwells on its cause and outcomes. In an effort to control this ecological disaster magic use by non approved sources is outlawed by death, enforced by The Jolly Mayor. The toxic bramble is held back by bramble crews in leather hoods and masks wielding fire, scythe and sickle with children collecting the pods and seeds, trying not to be stung by the brambles toxic thorns. These crews and the lower echelons of society pay the diffused price, there is an obvious hierarchy and bitter economy to the fantasy setting. Paolo Bacigalpi wrote “The Alchemist” that establishes the world setting and “The Children of Khaim” that explores a sinister shadow economy while Tobias S Buckell wrote the “The Executioness” which explores the wider hinterland and other solutions to the issue of the Bramble and the last story “The Blacksmith’s Daughter” which I feel is an interesting exploration of the circumstances of the protagonist and feels to me like a grim western in a fantasy setting, which may not be a fair description. Each of the four stories is a kind of snapshot in time of the progression of the setting and features reoccurring characters to convey a sense of their careers and the consequences of the preceding stories. Apparently the two authors collaborated over skype and much drinking was involved (Hendrickson 2018). Of course there is a drunk review of this book, because why not. Currently I am now reading Bettany Hughes “A Tale of Three Cities : Istanbul” (January, 2017), in it she speculates that the general ecological cooling in 535-536 AD may have led to the emergence of the (Yersinia) Plague of Justinian, increased mobility of Turkic tribes and an increased acceptance of marginalization of the female roles in Christianity, argued in terms of the writing of Saint Augustine of Hippo. It is generally agreed that early Christianity featured more equal status religious roles for women than Christianity as the official state religion after the Edict of Thessalonica in 380 AD, the conversion rates for early Christianity are similar to 20th century Mormon conversion rates, occurring exogenously through family units through the primary female members (Stark 230 : 1995). Of course a counter argument is that incorporation of Christianity into the Roman systems of power would increase its patriarchical features as traditional (pagan) Roman society was organized around patriarchical roles. There is an idea that the experience of environmental catastrophe can influence the formation and nature of a religion, which underlies the story of "The Executioness" and influences the game theory choices that people make in the fantasy setting of the story. Hendrickson, Eric. (March, 2018). 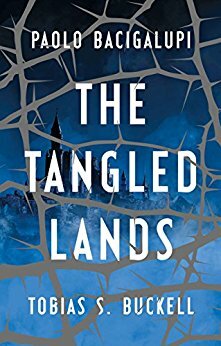 Overgrown Empire: Paolo Bacigalupi & Tobas S. Buckell's The Tangled Lands. @ https://https://www.tor.com/2018/03/05/book-reviews-paolo-bacigalupi-and-tobias-s-buckell-the-tangled-lands/. Last accessed 16/4/2018. Stark, Rodney (1995). Reconstructing the Rise of Christianity: The Role of Women. From Sociology of Religion Volume 56, Number 3. Pages 229 -244.